Mickey Callaway gets mets job. Reports indicate that the Mets have officially hired Mickey Callaway as the 21st manager in franchise history. 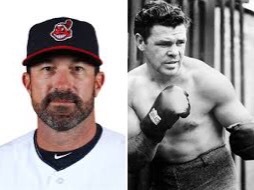 Mickey Callaway sounds like the name of a light-heavyweight boxer from New Jersey who fought during the 1920s, temporarily retired after breaking his hand before the crash of ’29, and then triumphantly returned to the ring in 1935 taking down a heavy favorite to become a champion who inspired the American public during the Depression era. In reality Mickey Callaway served as the Cleveland Indians pitching coach from 2013-2017 and was a prized managerial prospect. I’m actually shocked that the Mets came through and made a smart choice. This doesn’t appear to be the Wilpon choice (Manny Acta). It doesn’t represent the easy internal promotion option (Kevin Long). The Mets actually made a decision that is being lauded by experts across the sport. Color me surprised. Hopefully this is a sign of things to come for the offseason. First a smart managerial signing that doesn’t have the Wilpon stink all over it. Perhaps we’ll be able to say the same thing about some future free agent signings? Pray. My only reservation with Callaway is that I assume he’ll represent a change in overall pitching philosophy for the organization. Given that the organizational pitching philosophy was supposedly a strength of our stupid franchise as recently as 6 months ago, I’m not sure if that type of change will sit well with Matt Harvey, Jacob deGrom, Steven Matz and the other young pitchers currently in the majors. We’ve already heard Noah Syndergaard complain about the firing of Dan Warthen and basically call the organization out for scapegoating him. I wonder how receptive these guys will be to a totally new voice that directly challenges the way they go about their business. Maybe that’s what they need. After reading more about the guy, it sounds like he’s well respected and has a great personality. He supposedly has great communication skills and stresses “throwing strikes” which 1) wouldn’t represent a change to the organizational pitching philosophy and 2) isn’t exactly rocket science. Former players seem to indicate that he’s more of an approachable advisor and not the kind of coach that shoves his ideas down your throat. Here’s some video of the guy speaking about the 2017 Indians. The bottom line is I’m excited that the Mets are bringing in new blood with fresh ideas, and it makes sense that they’d bring in someone focused on pitching. The Mets are built around pitching. Let’s see if a new voice can help revive Matt Harvey’s career in his final season in Flushing. Maybe he can get something more out of Robert Gsellman and Seth Lugo. Maybe his routines and methods will lead to healthier seasons from guys like Steven Matz and Zack Wheeler. Or maybe Callaway will crash and burn. After all, he has no major league managerial experience. I do like that he has spent time working under Terry Francona. It can’t hurt that he had Tito as a mentor. The Mets offseason is off to a good start. The Mets are finally moving their Triple-A team out of Vegas to Syracuse. The Mets fired Ray Ramirez. The Yankees aren’t winning the World Series (at least not this year). We hired a popular young coaching candidate in Mickey Callaway. It’s rare that we see one positive headline connected to this team let alone multiple positive stories in a row. Let’s keep the good news coming. –Dear god. You could not have been serious. You know the Wilpons and their debt servicing still own the team, right? –My reservation with Callaway is that in the linked interview he sounds like an imbecile. He doesn’t even string the usual rancid cliches together in an interesting way. His speech is sluggish, he yaps “daily basis… daily basis… daily basis…” like a windup doll on the fritz, and appears absolutely stunned to be able to impart the knowledge that the team that scores first wins a lot!